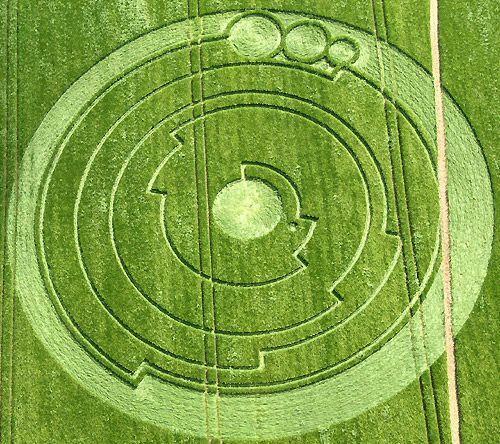 Web News System: THE MYSTERY OF CROP CIRCLES – Alien Calling Cards? Over the years, obscure and mostly meaningless formations and indentations in fields and land usually owned by farmers have been randomly discovered around the world spanning the United Kingdom to Canada. Are these so-called alien formations manmade by hoaxers or could they be the calling card left behind by actual extraterrestrial beings? Everyone loves a good mystery and the idea of where or who makes these crop circles has been an interesting topic of long conversations over the years. The term “crop circle” is actually pretty modern, only becoming the buzzword for these strange land anomalies in the early 1980s by a man named Colin Andrews. In actuality, these crop circles mostly done in the dark of the night are created by flattening farmers crops and creating designs that bewilder the public, seemingly destructive in nature and yet at the same time these beautiful and different configurations capture the eye when viewed from above. 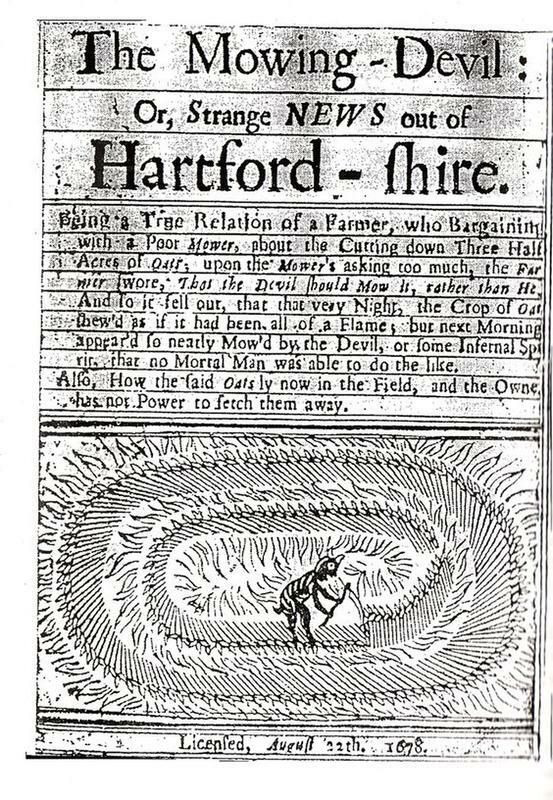 The first piece of evidence is an illustration from 1678 that appears to show a field of oat stalks laid out in a circle. Some take this to be a first-hand account of what is now called a crop circle, however, some historical investigation shows otherwise. Marks like this were found described in a pamphlet called The Mowing Devil. According to an English farmer, this legend was described happening in 1678 in which he was arguing with his neighbor, also a farmer, about his field of oats and paying a certain fee to get the job done. He was quoted as saying “I would rather pay the Devil himself” to do the job than pay his neighbor. In the pamphlet, the circles were described as “spiraling circles in a field done by the devil”. The drawing is of the devil himself holding a scythe and working the field, creating a rather intriguing design in the midst of his work supposedly all done during the night. Today, according to some, this story is considered more folklore than fact as it’s been stated that it actually wasn’t crops at all, but rather just a grassy field. The most common crop circles started appearing in the English countryside during the 70’s, however, it was during the decade between 1980’s and the 1990’s when these crop circles began increasing in number and complexity of each design, mostly from flattened crops of wheat and barley used in making cereal. In fact, in 1990, over 1,000 of these crop circles have been sighted and reported all over the English countryside as well as now being sighted also in Canada. Since then the area around Wiltshire has become an increasingly popular area exhibiting a vast portfolio of more elaborate crop circles. One example is a 150-foot-wide (46-meter-wide) crop circle that seemed as if it was a coded representation of the first ten digits of the mathematical constant Pi that appeared in 2008. Many have laid claim to these crop circles happening only to have their stories debunked. As in the case of what some call the first crop circle which appeared near the small town of Tully, Australia in 1966. A farmer claimed he saw what appeared to be a UFO close to a marshy area of land. 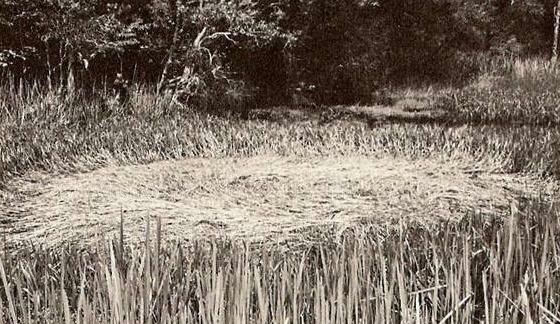 He also claims that in that same area there seemed to be a circular region of reeds and grass that had been flattened. However, later police investigators said this occurrence was most likely caused by the weather, known as a dust devil or waterspout. Or was it? 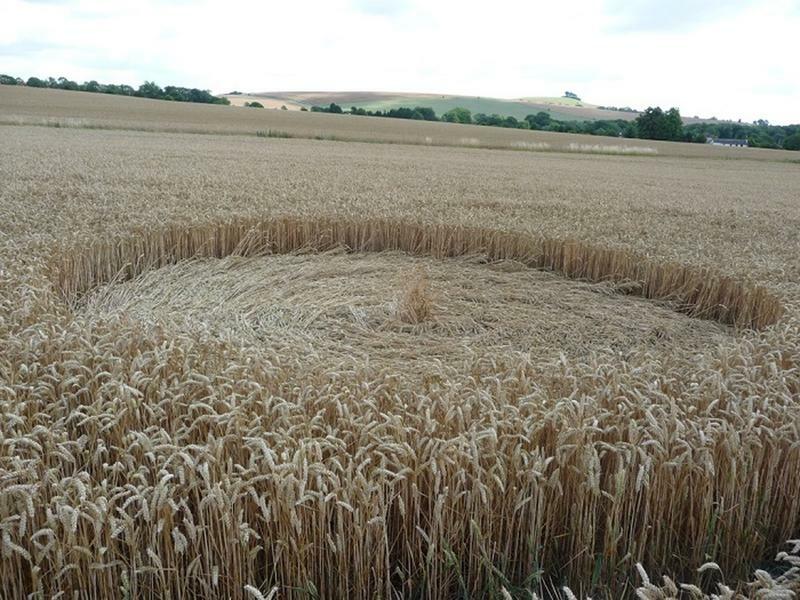 One of the most famous and important crop circles in history today was actually produced by three hoaxers who later confessed they did it in the very early hours of the morning and it took them about three hours to create. It had only been noticed much later that afternoon by someone flying over the area. 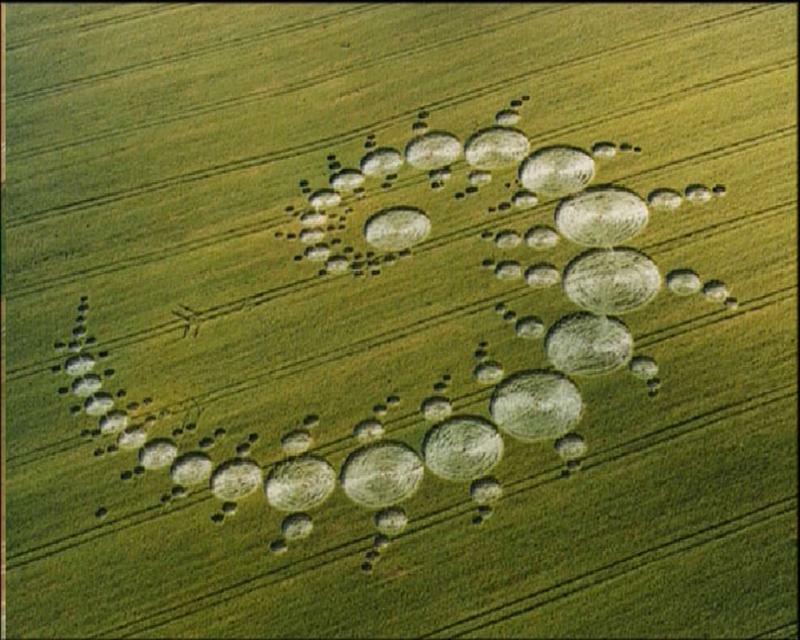 It was in the summer of July 1996 and dubbed as one of the world's most intricate and stunning crop circles that appeared in the countryside of Wiltshire, England. Although other shapes and sizes have been found in these phenomenons, if you think about it, circles are the easiest shapes for hoaxers or human beings to create making the most of the light on full moon nights the most popular times. One would think with today’s technological advances there would be some type of evidence recorded. This makes them even more suspicious and mysterious. So, the questions still remain to this day. Are these so-called crop circle patterns cryptic messages from beyond, freak weather and wind patterns, or just humans putting their own creative imagination artwork out there for the world to see? We may never know the exact cause or the “who” behind these marvelous works of art, but one thing is for sure, they are an incredible sight.